John Woods Nurseries is playing its part harnessing some of this country’s best young horticultural talent by becoming an integral part in the ‘Ideal Young Gardeners of the Year 2012’ competition which is being run in Association with the Prince’s Foundation for the Built Environment. 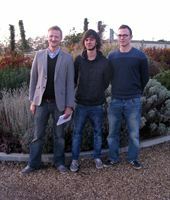 This prestigious competition throws together six UK colleges whose students have been challenged with creating inspirational and sustainable show gardens which will be exhibited in the forecourt of Earls Court during next year’s 104th Ideal Home Show, running 16th March– 1st April 2012. The Suffolk-based company has been chosen by organisers to supply some of the plants for the gardens, which will be judged by a panel of experts including John Woods Nurseries’ managing director, John Lord. MD John Lord said: “So far two colleges have visited our nursery, Writtle College from Chelmsford near Essex, and Capel Manor College in Enfield, Middlesex, who won the inaugural 2011 competition, and whose garden was visited at last year’s show by HRH, the Prince of Wales. “We are delighted to be supplying plants for the gardens, focusing on our new introductions and signature lines. The 2012 competition, which is staged in association with the Prince’s Foundation for the Built Environment, was officially launched last week (November 30th) by Channel 5’s TV gardener, David Domoney, who is also on the judging panel. Each college will be given one week to build and plant their garden outside Earls Court ready for the Ideal Home Show opening day on March 16th. During this time they will be monitored and supported by Domoney in preparation for the judging panel. Each garden will then be judged at the show on March 16th, by the panel which also includes award-winning garden designer Adam Hunt, who created the edible garden at HRH the Prince of Wales’s START festival at Clarence House in the summer 2010. This year, the participating colleges will be awarded gold, silver or bronze medals, with two further prestigious titles presented for ‘Best At Show’ and ‘The People’s Choice’. The Prince’s Foundation has set clear guidelines for the competition based on organic and sustainable principles. In addition, each garden should inspire city dwellers, showing just what can be achieved in the most impossible of tight urban locations. Hank Dittmar, Chief Executive of The Prince’s Foundation, said: “The importance of green spaces both in urban living and sustainable lifestyle is often overlooked and we are pleased to once again be launching this competition, particularly ahead of the launch of our landscrafts programme later this year.